creating these chipboard calendar magnets!! I know I've already posted this project before but I just had to show you the 2 calendars I made for teachers/friends this past Christmas. Now, bear in mind that I did use non-TAC patterned paper but they turned out beautiful!! My dh was able to get a "sleeve" of coasters from his Miller Distributing client so I could make these calendars!! I first glued a business card magnet on the back (to cover most of the beer logo) with FabriTac glue. Then I glued a piece of patterned paper to the front of the coaster, rounded and sanded the edges, attached a calendar I printed using free software from http://www.red-castle.com/software/fw/printcal.htm, attached a floral (one from the floral department that I just pulled apart), and attached a stamped tag raised with popdots. Whalaa!! These are sooo addictive!! Why don't you try one for yourself and post your creation in the comments. 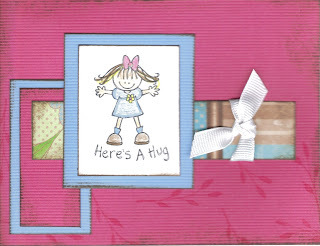 Anna cardstock with the Catelynne paper collection. These compliment each other so nicely. If I had the Lilly Anna hardware, well I would have used that too. The coloring was done using prismacolor pencils. 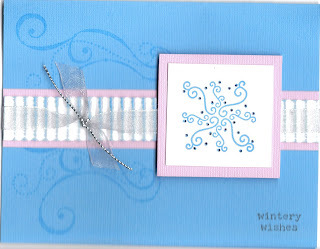 This card is all about mixing and matching different things. Another example, is the stamp sets used. The little "twig" is from Deco Designs and the little girl is from Kid Praises. I didn't mention this cardstock, but it is textured with a "washboard" effect. It gives a really neat look. The new spring/summer TAC catalogue is now here!!! For you scrapbookers out there, this is the one for you!! I absolutely love the new word sets and all those flourishes!!! My new year's resolution (one of them) is to get going with my scrapbooking. There are new paper lines, new word sets, new flourishes, and all those matching embellishments!! Yippee!! So, if you would like to get your hands on one of these new catalogues, please let me know by Monday, Jan. 7. If you order one by this date, the cost will be $5 but after that date, you will have to pay tax/shipping. Or if you would like to host a funshop, let me know that too!! my Memory Purse!!! I had fun creating this wonderful scrapbook page and have really received a LOT of compliments on it. Like I said in an earlier post, it is really small inside but then don't we all need to downsize our purses a little? I also am showing off my "bag tag" that I made for the group of swappers I'm in. I made these for seminar thinking that this way when we all got our new TAC bag, we'd be able to tell them apart by the monogram!! The bag tag is made using a baseball card sleeve and a binder ring with coordinating ribbons attached. The monogram was stamped with Alpha Grunge stamp set (my all time favorite) and then cut out. By the way, the drill press works great for punching holes through the baseball card sleeve!! Well...Christmas, 2 Birthdays, and New Years later, it's all finally over!! I wanted to share with you the 2 Christmas cards I sent out this year. 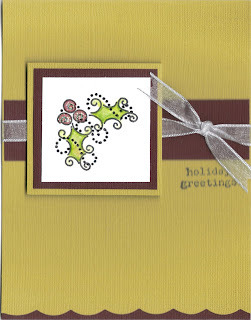 They were inspired by JenCarter from whom I received an amazing swap card a couple of months ago which prompted me to buy the Swirly Seasons stamp set. I love this set....I can't wait to use it for my Valentine's Day cards too!! It is such a versatile set. This first one uses the holly, was paper pierced and was lifted off the card by pop dots. I also scallopped the bottom of the card with my 'old' scallopped scissors!! The second card uses JenCarter's idea and I broke out my paper crimper and inked away!! Here is my version of the swap card I received. Enjoy! !